Amidst the glistening skyscrapers and plush resorts of the city of Erbil in northern Iraq lies a hidden tragedy. Tens of thousands of displaced Christian refugees stream into the area, seeking shelter from the brutal hands of ISIS militias. Most Rev. 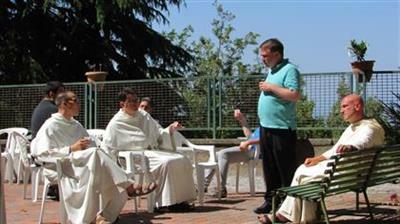 Mashar Warda, second from right, speaks to the Order of the Blessed Virgin Mary of Mercy members in Nemi, Italy. The sad story of homeless evacuees, almost completely ignored by Western media, is a replay of the same tragedy played out over the centuries, in which Christians and those of other religions were forced at the hands of Muslim extremists to either give up their faith or accept slavery or death itself. In an attempt to offer help, a Catholic religious order, founded centuries ago to redeem such captives, has stepped in to ease the pain of the suffering Christians. The Order of Mercy, with members in the United States, has twinned with the Archdiocese of Erbil as an attempt to offer hope, healing and material support to those persecuted. The 1.2 million Christians in Iraq have been reduced to 300,000 over about ten years because of the persecution, according to the official announcement of the Order of Mercy, known formally as the Order of the Blessed Virgin Mary of Mercy. Against a backdrop of a land rich in history, including Abraham’s journey from his homeland in Ur, the Most Rev. Mashar Warda, Chaldean Archbishop of Erbil, accepted an invitation to meet with the Order of Mercy. 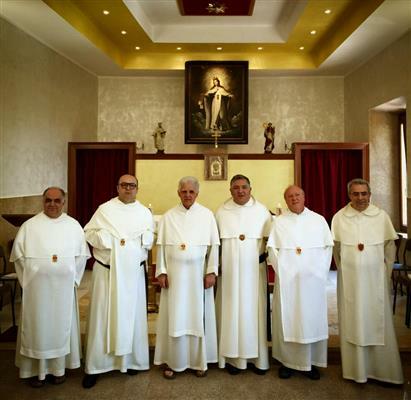 The Order was meeting in Rome recently as part of its official chapter meeting. The Diocese of Erbil is now welcoming thousands of families fleeing persecution. The Roman Province of the Mercedarians has officially adopted the Archdiocese of Erbil and has donated several thousand euro, and is now praying for the diocese. A friar from each of the order’s countries – Italy, United States, and India – will be appointed to go on a fact-finding mission to Iraq to find ways the Order can help. 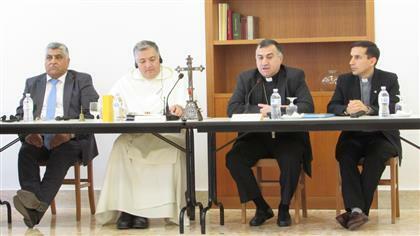 The Archbishop also asked for help in starting a Catholic university, which he called the Catholic University of Erbil. He asked first of all for teachers who could teach English. He explained that as Christianity in the Middle East, and in Iraq in particular, is experiencing a critical stage in its history that threatens its very existence, the Catholic University of Erbil should serve as a contribution to save what culture can be saved. It would also preserve the identity of its civilization and its rich culture and heritage. This includes a people that founded ancient civilizations that once flourished in Mesopotamia and in the East in general, and offered the world its first alphabet, script, the wheel, school, literature and music. The culture also served for centuries as a bridge to the East for transferring Greek philosophy as well as science and knowledge in general. Also, these people carried the Good News to Mesopotamia and to other lands and the heart of the East, as far as India and China. In the United States they are present in Pennsylvania, New York, Ohio and Florida. Read about their charism at OrderofMercy.org/charism.html. Visit their Facebook page at Facebook.com/pages/Mercedarian/. When Julie and Greg met it seemed to be the perfect match. They fell madly in love. Their temperaments and interests seemed to be perfect for one another. They complemented each other even from a spiritual perspective. Julie was raised in a traditional Catholic family which emphasized Mass attendance and proper behavior. Greg, on the other hand, was from a family which had converted to the Church. His family was not as devote as Julie’s family, but they were people of faith. With the happiness of those early years, who would have expected that dark clouds were beginning to form. Trouble really started when Greg left the military and got the dream job in Texas. The position offered a significant pay increase. The Alexander’s were beginning to get a taste of the good life. They bought a beautiful house in an upscale neighborhood. Greg put his heart and soul into work, while Julie made new friends in the neighborhood. Many of these women were successful career women bring in large salaries. While drinking wine they would all brag about their careers and positions of prominence. Julie felt left out. Compared to these other women her life as a homemaker seemed boring and insignificant. Finally, Julie made the decision to go back to work. Her persuasiveness earned her a job at a local fitness club. It wasn’t long till Julie also began climbing up the economic ladder. Her dedication and talents earned her a promotion to a position many miles away from her family. Julie would only be spending a few days at home a week. In her mind, Julie rationalized the decision as the best for her career and the family’s income. However deep inside her, Julie felt empty and “spiritually divorced from her husband.” Work gave Julie the affirmation and meaning that she didn’t experience at home. Then one day, the house that the Alexander’s had built on sand collapsed.Everything came to a head when Greg finally gathered the courage to say, “I am miserable”. At first Julie was taken back, but after reflection she realized that she too was miserable. She had been finding ways to avoid Greg and the problems that existed between them. The couple had been so busy making money and accumulating things that they rarely talked. After a time of discernment, they decided to get a divorce, but lived in the same house while making preparations. Even with all their marital problems, the Alexander’s still faithfully attended Mass out a feeling of obligation. A new priest had come to the parish who was a gifted preacher. There was something about this man’s words that caught their attention. They actually “enjoyed” this priest’s homilies! One Sunday the couple had the idea that they had to speak to this priest about their pending divorce. For both of them it was the 911 last chance that they would give God before making things final. The meeting with the priest was an actual grace for the couple. They came to discover that this priest was a Canon Lawyer who worked for the diocesan marriage tribunal. Because of his position, he was not able to counsel couples.Instead, the priest gave the Alexander’s some “homework” to do in order to come to know God’s plan for marriage. This simple step began a long journey towards an appreciation of the gift of the Sacrament of Marriage. They studied the basis for the Sacrament found in Sacred Scripture. The couple began to read the wealth of wisdom found in the Church’s two thousand year teaching on marriage and family. After reading documents such as Familiaris Consortio (St. John Paul II). Humanae Vitae (Blessed Paul VI), and the Catechism of the Catholic Church, they were blown away by the beauty and richness of God’s plan for marriage. Like St. Paul, Julie and Greg Alexander had wasted years of marriage serving themselves and dishonoring Christ’s Sacrament. Only as they began to study God’s plan for Matrimony, did they realize what a mess they had made of their marriage. Praying together they promised God that if He would somehow save their marriage they would give their lives helping other couples discover the beauty of the Sacrament. The Lord answered this prayer which He had placed on the hearts of the Alexanders. Within a few years, they were both working full-time promoting the Covenant of Love marriage ministry in parishes. This ministry is based on empowering married couples in the parish to minister to others. It is a five year curriculum which assists couples in living God’s plan for marriage. The mystery of the Cross is that God chose to take something evil and bring great good from it. When the Jesus knocked Julie and Greg off their horse (Acts 9:1-10),he did not condemn them for their many sins. Instead, Jesus used them and their broken marriage to bring light and healing to other couples. May married couples never despair of their woundedness, but rather allow the Divine Physician to heal and strengthen their love for each other! For with God there is always hope and all things are possible! The following is a continuation of the highlights of the Provincial Chapter in Nemi, Italy. The Chapter began May 30 and concludes June 6th. This day began with Mass in honor of our Holy Father Peter Nolasco, in this year especially dedicated to him on our journey towards the Jubilee of 2018. The particular prayer intention was for the Mercedarian Superiors and the whole Mercedarian Family. At 9.15 am we began the session by continuing the reading of the reports. It was time for India, and the report was read by the community Edacochin. Then followed Elantikara and Cuddapah. After the questions, there was a pause, and we returned at 11 am. Information was presented regarding the communities of Munnar, Patlur, and Eraviputhenthurai. Then came some information about the vocational-formative work in the Mission of India. Before lunch, there was an unplanned event: there was the singing of the National Anthem of Italy, given today, as it is the feast of the anniversary of the Republic of Italy. In the afternoon we entered into the programming phase, for which, after the methodology of the work was given, we were divided into 4 groups formed by 8-9 Religious composed of those from Italy, USA, and India. It was a good way to experience the diverse sensibilities and perceptions, and to understand the various languages, cultures, ages, etc. that can be gained from the lessons and examples that help to increase communion in the Roman Province. At the end of the work by the work groups, we returned to the Assembly where the various secretaries of the groups gave a synthesis of what was said in their respective groups regarding the first area, the fraternal life of the community. The path that was traced that will help us follow a journey which will bring us closer to the goal that we ourselves will travel for the next triennium: The first witness is that the Religious offer to the world is their own consecration, lived in fraternity in the local and provincial community. At 7:30 am, the day began with the Liturgy of the Hours (the Office of Readings and Morning Prayer) and the communitarian prayers. Afterwards, we returned to the Assembly for the reading of the Verbale and the vote on the group work in the area of Religious Life. A very touching moment of this day was the visit of the Archbishop of Erbil (in Iraq), Mashar Warda, who was present in Rome for a few obligations and accepted the invitation to visit the Chapter Assembly. In the presence of all the Capitulars, Archbishop Warda gave information that very clearly “provoked” us: the Christians of Iraq are fleeing because of the continual persecution. In 2003, there were nearly 1.2 million Christians in Iraq, now in 2014, it was reduced to 300,000: in ten years they were reduced by 25% of what they were before, and the persecution continues. There is a real sale of Christian slaves, especially women and children, that they take to sell in markets. We then returned in time to that which regards the Islamic violence confronting the Christians that do not have many possibilities to flee: either they convert to Islam, or they pay a tax, or they leave. Many times, however, they are killed. – To support the social-educative services, and bring them forward. The Diocese of Erbil is, in fact, welcoming thousands of families fleeing persecution. 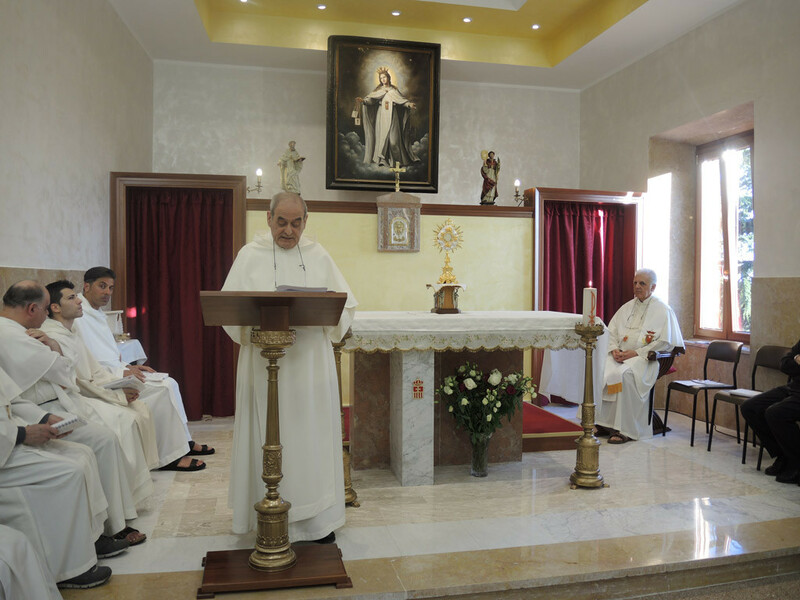 The Roman Province has “twinned” itself with the Diocese of Erbil, and now, has remembered it in prayer and in the donation of several thousand Euro. We continued our group-work for programming the next three years, and the evening ended with Mass and the recitation of Vespers in honor of St. Charles Lwanga and Company, martyrs, while the intention of the prayer was for the dead, especially those of the last triennium. The day began with the Holy Mass and Morning Prayer celebrated according to the ordinary intention: for vocations and their formation. The first gathering of the assembly was dedicated to the vote of the program, prepared by the Commission and then discussed in some cases, which was worked on in the four work groups. As the vote was rather quick, we divided into geographic groups (one for India, one for the USA, and two for Italy) to integrate, if it was needed, the various areas of the program with initiatives and instruments of a more “local” flavor. These initiatives were then presented in the Assembly and approved. The election phase began in the afternoon with all of the Superiors giving their envelopes containing the verbale and the ballots with the votes for the new Provincial Government. These ballots were opened by the scrutinizers, who counted the votes, and after the formal verification of the correct number, we proceeded to the scrutiny of the vote, at the end of which, Fr. General announced the candidates for Provincial and the Provincial Council. After a break, we returned to the Chapel for a penitential service with the exposition of the Eucharist. Fr. Giovannino Tolu gave the Capitular Fathers a reflection on three biblical themes: the Transfiguration, the perfume of Mary that she used to anoint the feet of Jesus, and the raised hands of Moses. The cry of joy of Peter in the Transfiguration is our cry: it is good that we are here! We want to tell the world that we do not know any other joy than to share the tent where Jesus dwells, brighter than the sun. Mary at Bethany loves without calculating and evaluation. 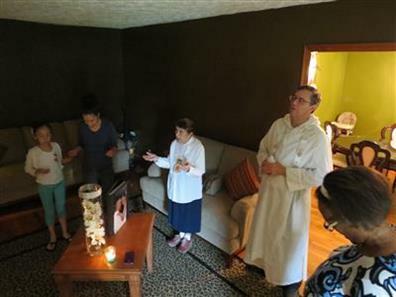 For many, the Consecrated Life is a waste and Religious are wasting this life. However, we choose to waste it only for Jesus, and for the captives. Only with charity to the captives, the oppressed, the imprisoned, and the least of society can we feel the fragrance of God’s love. Moses on mountain was supported in a way that kept his hands raised. It is a mystery, the strength of raised hands. Who prays is like one who has hands on the wheel of history. Without prayer you go off the road, you do not get to where you want to go. With the Holy Mass of the Holy Spirit, presided over by the Master General Pablo Ordone, we opened the day dedicated to the election of the new Provincial Government. The General, in his reflective homily, spoke of the Holy Spirit as a door to peace in the hearts of the community to help facilitate dialogue. A real dialogue, without closures and fictions that makes us consider ourselves all-important within this Mercedarian community that God has dreamed up for redemptive mission. The Spirit helps us in our discernment to lead us into a profound and existential friendship with Him; a friendship crossed by the Love of loves, able to say it is not I who live, but Christ who lives in me. At 9:30 am, the Chapter Assembly, after fulfilling the rites, proceeded to elect our Fr. Provincial: the result was that Fr. Francesco Podda was reelected, and he accepted the grave obligation. He then took the oath and gave the profession of faith. After a break given by the President of the Assembly, we began the vote for the election of the Provincial Councilors. These, after the election, took the oath. The Religious shared fraternal greetings of peace and well wishes with those elected. 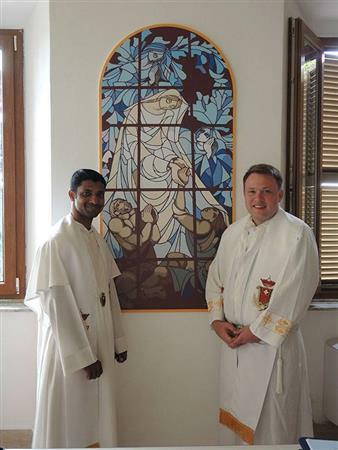 On 30 May 2015 at 9am, with the Holy Mass in honor of our Most Holy Mother, we began the 32nd Chapter of the Roman Province that includes 13 Italian communities, 6 from the USA, and 6 from India. Present were all 38 Capitular Fathers; Fr. General spoke of Mary as a model of our Consecrated Life, and Inspirer of every Mercedarian work. At 10:30 am, the Capitular Asslembly opened with the prayers prescribed by the Ritual, and the greeting of Fr. General which, making reference to the teachings of the Holy Father Francis, invited all to fall in love with the Mother of Mercy, keeping in our hearts attention to the peripheries of freedom. In the afternoon, at 4 pm, Fr. 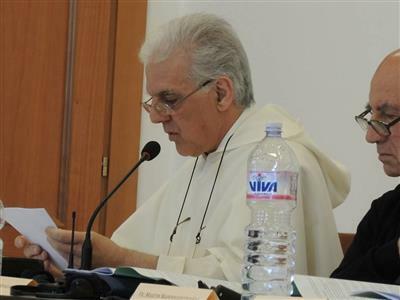 Sandro Barlone proposed to the Assembly a reflection on the Chapter as a time of dicernment, leaving some points for personal prayer and meditation. At 6 pm, the Assembly held a session of listening and dialogue. At the conclusion of the day, all prayed Vespers together, and celebrated the Saturday Mercedarian Devotions. Today, in the Universal Church we celebrate the Solemnity of the Most Holy Trinity, which overrides the Feast of the Visitation, the titular feast of the Roman Province, which, however, we still wanted to remember. At 7:30 am, we all returned to the renovated chapel for the celebration of the Office of Readings and Morning Prayers. Special booklets were prepared for the liturgy with the texts in both Italian and English, as our Province embraces brothers of the two languages. This is why the liturgy was today, as well in the coming days, will have this diversity of languages, in a communion that goes beyond words and finds unity in prayer. After the prayers, and a moment for breakfast, we returned in the Capitular Hall for the second session which began the Informative Phase. The first to speak was Fr. Francesco Podda who, as Provincial, presented the report on the state of the Province and of the triennium which just ended. 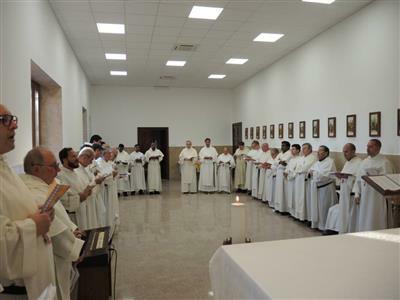 We were given some information: as of 30 May 2015, the provincial community was composed of 110 in Solemn Vows, of which 96 are priests, 4 are non-clerical brothers, and 10 are Solemnly Professed and on their way to becoming priests, 6 of which are already ordained Deacons. The Religious are distributed among 25 communities, of which 13 are in Italy, 6 in the USA, and 6 in India. At the moment, there are 18 Simply Professed in the Province, of which 2 are in the USA, and 16 in India. 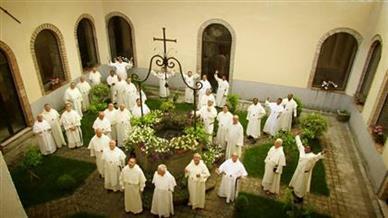 There are no Novices, however, there are 17 Postulants, of which 2 are in Italy, and 15 in India. Next followed the reports of the Vicar of the USA, Fr. Kenneth Breen, and of the Delegate of India, Fr. Vincenzo Pennella, who gave information on the actual situation in the USA and in the Mission of the India. In the afternoon, it was possible to ask the three speakers questions, and then, as time permitted, we began to hear the reports of the local communities. We began with Alghero, followed by Cagliari. At 7 pm, the Holy Mass and Vespers were celebrated. The intention of the prayer today is for the oppressed and persecuted, while the liturgy reminds us of St. Justin Martyr: a beautiful event since two of the Capitular Fathers celebrate their name day. They are the Fr’s. Justin Freeman of the USA and Justin Alex of India. After the celebration of the Office of Readings, Morning Prayers, the community prayers and breakfast, at 9:15 am, we had the session of the Chapter which took up with the reading of the reports of individual houses for those related to Italy. We began with Carpignano, followed by Florence, Naples, Nemi, Orvieto, and Padova. There were some relative questions to be answered and clarified, then there was a break. At 11 am, we continued with the other reports: Palermo, S. Maria della Mercede – Rome, and the Studentato (St. Peter Nolasco). In the afternoon we took up the reading of the reports of San Cataldo, San Vito dei Normanni, and with these, we concluded the part related to Italy. 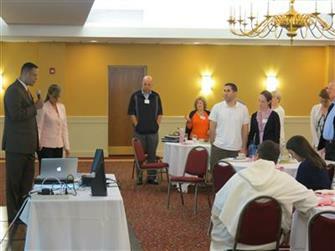 Afterwards we followed with information from the Vicariate of the USA: beginning with Mt. Carmel in Cleveland, and followed by St. Rocco (also in Cleveland) and Our Lady of Lourdes in Philadelphia. 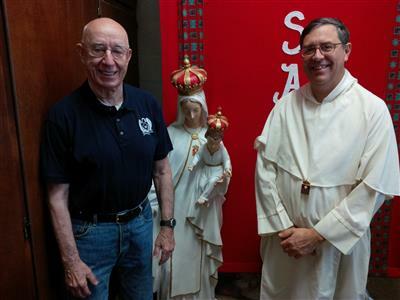 After a break, we continued with reports from the Monastery of Our Lady of Mercy in Philadelphia, Le Roy, the Nolasco House in St. Petersburg FL, and the report of the Formators in Italy. The one responsible for formation in the USA combined the data of this area to the report of the local community. After dinner there was a time of celebration in honor of the Community and of the brothers who were celebrating their name day, and we spend some time in healthy leisure. 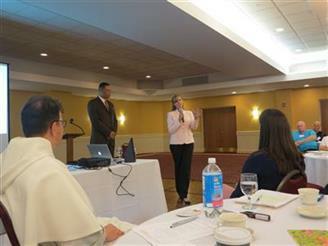 On Tuesday, May 5th the Archdiocese of Philadelphia sponsored a workshop entitled Marriage-Centered Communities: How to Build a Marriage Ministry in Your Parish. This addressed the current state of marriage in the world and the Church and offered practical ways that a parish can most effectively serve married couples. 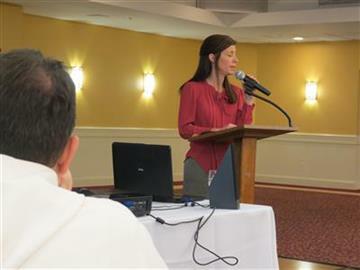 The first part of the workshop was led by Dr. Hilary Towers, a Catholic author and developmental psychologist from the Diocese of Arlington, Virginia. Dr. Towers’ presentation posed the question: “What heritage are we leaving to the next generation?” Much of her talk provided statistical data on the state of Marriage in our country. Today the divorce rate is 51% which is an all-time high. Surprisingly, new data shows that more Americans are getting divorced after many years of marriage. The percentage of divorces filed by those 50 to 60 years old is skyrocketing. There are various reasons given for divorce today, but some are more common than others. The most prevalent is that the couple has “grown apart”. A high percentage also claim that they separated because of an inability to “talk together”. Other common reasons given for divorce are “money problems” and “infidelity”. It is clear from the data that marriage as an institution in the United States is fading. At one time marriage was a part of the fabric of American society. It was expected that most young people would enter into this bond of matrimony in their 20’s and it would continue for a lifetime. Fidelity was taken for granted. Divorce and/or separation would occasionally happen, but it was a rare occurrence in society as a whole. To be sure, there have and always will be legitimate reasons for separation, but in general the goods of a stable bond far out way the contrary. Studies continually show that a stable home with a mother and father provides that best environment for raising children. Married couples can model so many virtues for their children. The couples teach by their example the good habits of charity, forgiveness, accountability, and commitment. Even in less than ideal situations, children are often given models of how to cope with weakness and sin in an imperfect world. What if our next generation does not have the stability of the traditional family? We are beginning to see that millennials have a much less confidence in the possibility of commitments. Today about 20% of adults 18-29 years old have decided to cohabitate and/or not even consider marriage. There is in general a lack of trust in others and in the institution of marriage. On a purely economic level, the increase of divorce places more children in danger of poverty. It also puts a greater strain on government and state agencies to provide for many single parent homes. Although things do not look so good for marriage today, there is much that can be done to help couples. As Dr. Towers says, “It is the Church working through the clergy and laity that will rehabilitate marriage.” Much can be done at the local level. The parish can and must build supportive communities of strong marriages. These married couples will become mentors of commitment for those who have none. The parish family also must pray for marriages at Mass and through various prayer groups. The laity need to encourage their pastors to preach about the Church’s treasury of wisdom on the Sacrament of Marriage. Parishes need to make accessible the practical components of a strong healthy marriage. Things are not looking great today for the institution of marriage. The statistics show that fidelity and commitments to marriage are at all time lows. Yet, this basic unit of civilization is of inestimable value to society as a whole. For the sake of future generations, the each member of the Church must do their part support this Sacrament. Our gift to the next generation must be this: a renewed commitment to the Sacrament of Marriage. On May 10th, Fr Ken and I began a journey from LeRoy, NY to Georgia with a van packed with r eligious goods. These items (statues, stations of the cross etc.) were from the former Mercygrove property which was recently sold. The proceeds from the sale are allocated in large part for the development of a new redemptive mission to families in the United States. The first stop on our journey was to drop off several items at Life Teen camp in northern Georgia. It felt good to be able to give these religious articles new life at a camp which each summer is packed with teens and young adults. After a two hour stop, we were back on the road bringing a special gift to our 3rd Order in Atlanta. Through these dedicated lay people, Order of Mercy has been present in Atlanta for 17 years. It all began in 1998 when a little woman left Rome and arrived in Atlanta, GA. Maria Virginia’s story is key to this movement which Christ would bless. The spirit of merced or ransom was placed in Maria at an early age as she was educated by the Mercedarian Friars in Puerto Rico. This spirituality would continue to grow in her throughout her life. When her husband passed away in his 60’s, Maria felt the Lord was calling her to enter the Sisters of Our Lady of Mercy. After a few years of formation, it became clear to her that Christ the Redeemer desired her to “go out to those in need” with the message of mercy. Many extraordinary circumstances led, Maria Virginia to her mission field in Atlanta, GA. Seventeen years ago she set up her home in Georgia and quickly got to work. Maria got permission of the Order of BVM of Mercy to establish a 3rd Order in a place where no friars or sisters had been. With her deep faith, love for Our Lady of Mercy, and boundless energy this women was able to inspire many to follow the redemptive spirit of the Order. with no one to shepherd them. 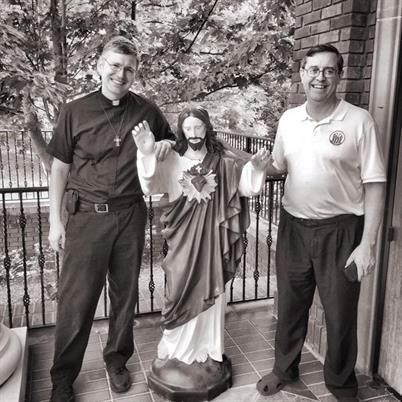 Fr Ken and I got to experience first hand the redemptive work of our 3rd Order in Atlanta. The week of May 11th was spent blessing houses and practicing our Spanish as we enjoyed authentic Mexican food with the the people. The highlight of the week was a outdoor Mass with many immigrant families. As we struggled to speak their language, they just appreciated the opportunity to come close to Jesus and teach their children how to worship. On this long journey into the Deep South an exchange took place. We brought statues and religious items which are plentiful in the Northeast. These are aspects of our culture which have preserved the faith of generations. We experienced tangibly the faith and devotion of the Mexican people. Hopefully our ministry among them has strengthen and enriched the faith of all. May Our Lady of Mercy place her mantle around the mission of the Atlanta Chapter of the 3rd Order! She who is the refuge of the captive and persecuted Christians, will surely watch over this mission to those in the are marginalized today. Every family has it’s patriarchs or those who paved the way for a new generation. The Order of Mercy, being a spiritual family, possesses many of these friars who are deceased and yet live on in our memories. Today we remember one such friar Fr Luigi DiTalia, O. de M. The following is an interview with Fr Eugene, the Order’s novice master, who lived and worked with Fr Luigi for many years. When did you first meet Fr Luigi? In about 1967, I first came to know Fr Luigi. In the beginning, I had difficulty understanding his Italian accent. But came to know him, little by little, as truly a father for our community. He never asked anything from us what he wouldn’t do himself. He was a great community builder. A great leader of our community and a very humble friar. About 6 or 7 years. He was superior and I was novice master. Fr Luigi always had a great sense of wisdom. He would say “Prudence and common sense are essential for religious life and for living the vows”. He just had great wisdom and advice for people for problems and difficulties. One of the things I liked about him was he would meet you one on one. Fr Luigi always kept confidences and really appreciated those who were in the community. What are some of the virtues or positive qualities that Fr Luigi exemplified especially for a Mercedarian Religious? I think he exemplified poverty. Very much so. He was a person who would be more willing to give than to receive. Though he, also, had common sense in poverty. We never starved. We didn’t have a lot of things, but what we had we appreciated everything more. He was truly a good religious. A kind religious. A genuine religious. He was honest and very sincere. I think that not only the Mercedarians loved him, but the people in LeRoy, NY loved him. For so many years he was stationed there. He was known as “the simple friar”. I think also he was a real leader who lead by example. He was a father to us more than a superior. He could combined those two qualities. Truly a person concerned about vocations. Concerned about the Mercedarian way of life and the fraternal life. This is one thing that he insisted upon. He and Fr Marciano really lived the fraternal life which is a key to understanding the religious life. Can you tell me any story that you remember about Fr Luigi? One of those stories about one of our founding fathers in the USA that we can pass down from generation to generation. I heard that one time he said in LeRoy he had difficulty with the language. He said one of his first sermons was, “I am Fr Luigi and I love you all!” This was because he had so much difficulty with the English language at first. He did tell a story one time about how he suffered in the war. He said that he was one of the “Brown Shirts” because they had to be at that time. But I don’t remember the details. Lastly, I know that in those last years there was a time when Fr Luigi had a stroke. How do you remember those last years? They were times when you were realizing that you were not going to have this great presence with you much longer since he was one of the real “rocks” here in the US for the Vicariate. Can you say anything about those last years and how he handled the suffering? I think that those last few years were difficult for him, but he still had a true sense of being a real Mercedarian and a real model for us in a different way. Though he often couldn’t be at chapel because of his infirmities. I remember him saying the rosary and always at the third hour, the Hour of Mercy he would put on the television and pray the Divine Mercy chaplet. But what I think really was significant is that he never gave up during these times and he was very serene and accepting of his suffering. These sufferings are for the Order, for the Vicarate. Even though he could not lead he led by his prayerfulness and his holiness. He never gave up. Human existence we can get upset about things, but most of the time he was very accepting of his sufferings. And, he tried as best as he could to lead others by his example and his advice. At times he would turn to people and talk to people privately. He would give them advice which was very fruitful. He was a leader then by prayer rather than by being in charge. He lead by his example, by his prayerfulness, by his faithfulness and consistency in loving our Order. Rest in Peace Fr Luigi! May your soul and all the souls of the faithfully departed rest in peace! The Order of BVM of Mercy announces the Ordination of one of it’s own. On Saturday, November 16th Deacon David will be Ordained to the Sacred Priesthood in his home town of Norfolk, VA.
Br David with the youth of the parish. As Catholics, we believe that the ministerial priesthood was instituted by Christ at the Last Supper. There he commissioned those he had chosen to act in His person when administering the Sacraments. The Sacrament of Holy Orders places an indelible mark on the soul of the man ordained. He is able to act in persona Christi or in the place of Christ. Mercedarian priests focus their priestly ministry specifically at the service of those in danger of losing their faith from modern forms of captivity. The soon to be Father David entered the Order in the fall of 2005 as a postulant. In 2007, he made his first vows. After completing his studies at St. Charles Borromeo Seminary, Br David received his Master of Divinity and MA in Theology. In September of 2012, he made his Solemn Profession in the Order. April 2013, Br. David became a transitional deacon. Since 2012, Deacon David has been assigned to Our Lady of Lourdes Parish in Philadelphia. He has been serving at the parish as director of religious education and youth director as well as a variety of other tasks. After Ordination, Fr David will begin his priestly ministry as parochial vicar of the Our Lady of Lourdes. Please keep our brother in your prayers as he becomes “another Christ” to serve especially those in danger of losing their faith.